What you see on the outside is a reflection of what is going on inside. 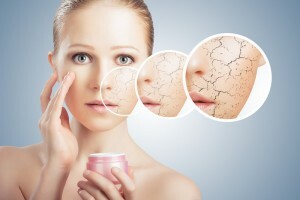 Anti aging skin care has to address all of the issues. Avoiding oxidation is the top anti aging skin care secret. Smoking, sun exposure, poor diet and exposure to toxins causes oxidation which is the main cause of wrinkling and loss of collagen and elasticity. Add coenzyme Q10, 30 to 100 mg ,which will give you energy to regenerate and repair. Add the master antioxidants alpha lipoic acid which is a broad spectrum fat and water soluble anti oxidant plus and N-acetyl cysteine that is the precursor to glutathione a master antioxidant and detoxifier. Both recycle other anti oxidants. Lutein and zeaxanthin found in kale, spinach and chard may protect against sun damage and are essential elements of anti aging skin care. They are also available as supplements. Protect your skin against damaging rays from the sun using a sunscreen that blocks UVA and UVB rays such as zinc oxide and titanium dioxide or avobenzone. Avoid sun at peak hours of the day between 10AM and 4PM. Don’t smoke! Smoking is a major producer of free radicals that causes wrinkling. Eat plenty of colorful fruits and vegetables that are full of anti oxidants and phytonutrients that you can’t get in a supplement. Reducing inflammation can make your skin clear, smooth, supple and blemish free and is an essential component of anti aging skin care. Detoxify by doing an elimination diet such as the Shake, Bake and Salad Slimdown with detoxifying herbs and supplements. This includes avoiding the troublesome 10 for 2 weeks: alcohol, artificial sweeteners, caffeine, corn, dairy, eggs, peanuts, sugar, soy, wheat and anything with gluten in it. Watch your skin clear up and glow. Test foods after the elimination diet and avoid those that cause symptoms, which are a sign of inflammation. Reducing inflammation is not only for anti aging skin care, it is the root cause of most major illnesses and can reduce your risk of many diseases of aging. Eat more fats that flow that is anything that can be made into oil such as fish, olives, avocados, nuts, seeds and any of their oils. Anti aging skin care requires that you eat less sugar, grain, starches, meat, dairy and saturated fats, trans fats and hydrogenated oils, which cause inflammation. Add a good quality fish oil with an EPA/DHA content of at least 700 in the natural triglyceride form. Balancing hormones can keep your skin elastic and preserve collagen and is not just for anti aging skin care, it can slow the aging process by preserving memory, bone, brain, heart and preventing illness. Reduce the stress hormone cortisol that breaks down collagen by taking a potent multivitamin with at least 50mg of B vitamins, 1,000 mg of Vitamin C and 400 mg of magnesium. Reduce stress with deep breathing, yoga, tai chi, and any stress reduction technique that works for you to avoid collagen breakdown and worry lines. Assure you have adequate estrogen, which keeps skin elastic and lessens sagging. Topical estriol cream is especially good for skin, which has specific receptors for this weak estrogen. It is a safe estrogen to take if you don’t want to be on hormone replacement. Build collagen with from the inside out with Choline-stabilized orthosilicic acid. It works on restoring hair, skin, nails and bone. Have your hormones measured and balanced and consider hormone replacement therapy when symptomatic. Of course there are many potions and lotions, injectable botox and fillers and other things you can add to your regime. An anti aging skin care regime has to work from the inside out to preserve your skin and overall health. Start with the basics, which are less expensive and reap greater rewards. Consult with a functional and anti aging medical specialist to get the best results.